Hey everyone! Welcome to the weekend! 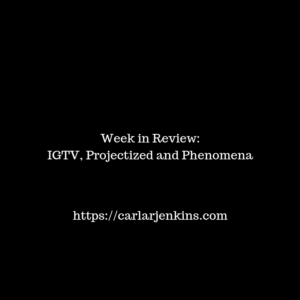 This first full week of 2019 has been hectic yet productive in the areas of IGTV, debuting my new Projectized show and Phenomena’s debuting its LinkedIn company page. Everyone knows that I LOVE video so getting on IGTV (Instagram TV) was a no-brainer! Well, it comes to no surprise that I have debuted my IGTV icon button onto www.carlarjenkins.com . It is right next to my Facebook button. Now you can see all of my IGTV videos there. Since I am talking about my IGTV channel, this is the perfect set way into Projectized. Projectized is my new Periscope livestream show where I discuss the business of project management, how businesses use project management and how become project management certified. I upload replays on IGTV and YouTube. You can catch my Projectized show on Periscope 2-3 times a week during the afternoons and evenings EST. 2018 was a very big year for Phenomena. Its CEO has received over 2000 followers. We expect even bigger things in 2019 so we’ve kicked off the New Year with debuting the Phenomena LinkedIn company page. As you know, I have a thing for livestream. I have been a Perigirl since its inception in 2015. I have taken it a step further by joining its Hears Tribe Waiting Room (I am in training and must go live on Periscope or Facebook Live daily from Monday through Saturday). This has provided me with an opportunity to broadcast my Projectized show; and, I talk about so much more. Last but certainly not least, www.carlarjenkins.com is running up the Alexa Internet site rankings. The site is firmly in the 800,000 global site rankings. I expect to soar even higher because of my burgeoning community and increased focused on my target audience.